There were two key take-aways from the recent elections and their aftermath in Zimbabwe: one, fasting and prayer don’t determine election results; and two, social media has profoundly changed the political landscape. 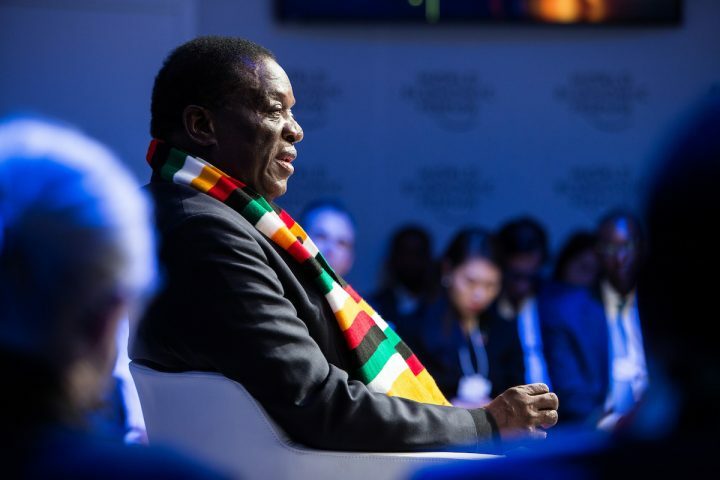 Emmerson Mnangagwa, President of Zimbabwe at the Annual Meeting 2018 of the World Economic Forum in Davos, January 24, 2018. Image credit Sikarin Thanachaiary via World Economic Forum Flickr. It’s been argued that social media proved to be irrelevant and overstated in determining electoral results in Zimbabwe, because Zimbabweans voted along traditional demographic and party lines. At face value, the election results suggest that reading is accurate. The ruling ZANU-PF won by large margins in rural areas, while opposition contenders only managed to maintain footholds in urban areas. And, independent candidates who ran slick social media campaigns or who relied on the momentum of a large social media following, largely failed to make a dent at all. But, the reduction of politics simply to poll performance understates the important role that social media has in fact played in the recent re-formulation of Zimbabwean politics. Over the last two years, the country has seen the evolution of a digitally-driven, and increasingly vocal and politically active local and diaspora population. Much of this socio-political transformation has taken place online, outside a formalized, State-sanctioned political forum. Yes, this transformation has largely fallen under the purview of a “young urban elite” and critics have correctly noted the absence of a distinctly rural voice. Nevertheless, Zimbabwean Twitter feeds, WhatsApp threads and Facebook walls have become digital town halls for expressing dissent and debating the goals, merits and methods of political and social transformation, and more recently even as spaces for engagement between citizens and the State. Just a few years ago, it was close to impossible for ordinary Zimbabweans to engage with state institutions in a way that might result in both effective policy change and no danger to personal wellbeing. But, by early 2016, social media platforms were being used to obtain and disseminate political information, and to engage in debate and satire, changing the tone and accessibility of politics at the level of every day lived experiences. These platforms also became alternative spaces for activism. Digital activists calling for increased government accountability, prompting a new understanding of online organizing as a channel through which people, both at home and abroad, could engage meaningfully with politics. When Mugabe’s government reacted in typically repressive form against an atypical digitally-mediated adversary (by squeezing bandwidth, temporarily blocking WhatsApp, raising the rates of data bundles and introducing a cyber security bill), Zimbabweans creatively circumvented those actions (for example, by installing VPNs). By November 2017, politics as we knew it, was fundamentally altered. A coup/non-coup replaced Robert Mugabe with Emerson Mnangagwa, and the military previously feared as the enforcer of Mugabe’s authoritarianism, was instead viewed as the provider of liberation. Political change was formally announced by ZBC, the State broadcaster, but even before the revolution was televised, it was digitalized. In the days leading up to Mugabe’s dismissal as Head of State, Twitter and Facebook blew up with images of armored vehicles rolling into Harare, and speculations about their meaning. Whatsapp served as the primary means by which Zimbabweans alerted offline family members about the unfolding situation. The military’s first press conference, signaling regime change, was initially streamed on Facebook. In the days after the coup/non-coup, it was again on Twitter and Facebook where people chronicled celebrations with their soldier baes. Following Mnangagwa’s installation as interim President and his formal commitment to holding free and fair elections in 2018, politicians all around the country formally launched spirited online campaigns. The main opposition party, the MDC-Alliance, and its leader, Nelson Chamisa crafted a campaign that called for a generational shift in leadership. Facebook live became a stage for civic engagement and e-rallies. Twitter feeds were used for political deliberation. In run-ups to previous elections, Zimbabweans had become accustomed to receiving food and other assistance from the State in exchange for attending political rallies. In this year’s run-up to elections, the MDC-Alliance petitioned Zimbabweans, not only for support at the polls but also for financial contributions to purchase advertising and campaign materials. In the 2008 and 2013 election cycles SMS’ were sent out to mobilize support. This year, politicians and their strategic teams used Whatsapp to distribute campaign messaging to previously disconnected semi-rural areas, taking advantage of greatly improved internet connectivity in the country. In response, the ruling party, ZANU-PF, also ramped up its own campaign efforts, sending bulk text messages to all registered voters, allegedly colluding with the Zimbabwe Electoral Commission (ZEC) to access voter contact information. During the end-days of the Mugabe era, social media platforms were monopolized by activists and the opposition. During the months preceding the July elections, ZANU-PF, usually the least responsive to the public and its varied attempts to engage, became increasingly adept and strategic in its own social media maneuvering. Mnangagwa had his twitter feed refined from one he used solely to send out compliments of the season, party propaganda and ill-used but weirdly ominous idioms, to a verified platform on which he laid out his political vision, agenda, plans and accomplishments. Under Mnangagwa’s leadership, ZANU-PF brought a new energy to how State-run social media accounts were deployed to appeal to youth voters and people living in the diaspora. In March, Mnangagwa, ever the shrewd strategist, ordered the ZANU-PF youth league to take to social media to serve as online warriors/ thugs “kurakasha” (to hit hard/ batter) the opposition. It’s been claimed that ZANU-PF paid unemployed, computer literate supporters to flood social media platforms with attacks and counter-attacks targeted at overwhelming a poorly resourced opposition. The ruling party’s varakashi took on Chamisa supporters known as “Nerrorists” (after Chamisa’s nickname, Nero) in a series of online propaganda battles. The marked upsurge in the tactical use of inflammatory language, and fearmongering as well the distribution of fake news and doctored images, arguably buoyed some candidates while bringing others down. On election day, all three platforms were used by people chronicling their voting experiences. And the violent aftermath of the election that left several people dead played out online even as it played out on the streets. In the post-election period, social media and digital communications platforms have been used to claim voting irregularities, contest electoral results, and reflect public opinion. The Zimbabwe Electoral Commission has advocated banning social media for circulating electoral issues in future election cycles, claiming that these platforms were used to churn out poisonous mis-information during the recently contested one. The newly inaugurated President has continued to use social media platforms to try and quell public fear and anger, and to disseminate information regarding his policy initiatives, political appointments, and international engagements. Meanwhile, the MDC-Alliance continues to use twitter to proclaim its stolen victory. Following its expensive and unsuccessful challenge of electoral results at the constitutional court, it has taken to Facebook to ask the Zimbabwean public for donations to cover expenses, via mobile money transfers and contributions to a gofundme page. Most recently, the State has used social media and communication platforms in a widely scorned government-led crowdfunding campaign for resources to alleviate the current nation-wide Cholera crisis. Some Zimbabweans have questioned how Mnangagwa had the funds to pay for a chartered plane to fly the now-disgraced former First Lady Grace Mugabe from Singapore for her mother’s funeral in Zimbabwe, but does not have resources to fund health care and emergency services. But others couldn’t help noticing the novelty of the government’s request, which points to an alternative use and acceptance of social media platforms for governance. The changes in Zimbabwean political culture that have resulted from the cumulative effects of all these varied digital actions, cannot be ignored. From being used for calls for change to calls for funding, it is clear that social media has played a key role in reshaping political life in in the country. The ways that ideas and identities flow and are modulated, has shifted. Throughout this process, various tensions, contradictions, inclusions and exclusions have been exposed, and in some cases pre-existing social, cultural and political asymmetries have been amplified. These wide-ranging interactions have also resulted in never-before-seen multi-vocal and multiply-situated political dialogues among citizens, and between the State and its citizens. These alternative forms, mediums and modes of communication have redefined the parameters of political engagement in online and offline public discourse and point to key shifts in the performance of politics in Zimbabwe.